In time for her 60th birthday, Barbie has a new collaborator bringing her wide-ranging style to life for humans. 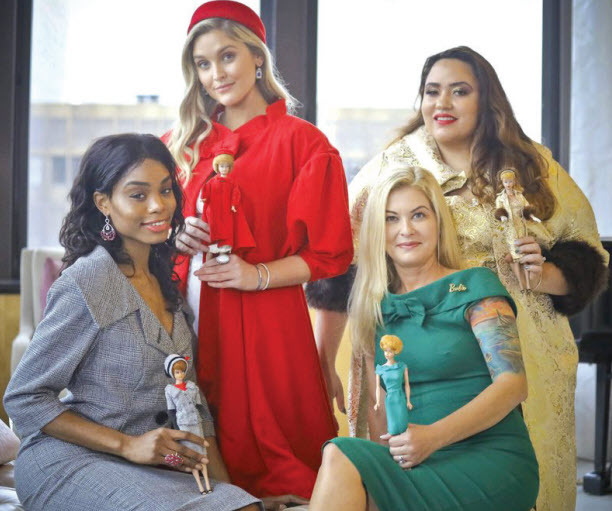 In the process, the company also has taken care of the one thing critics love to hate about Barbie, her very plastic hourglass physique, by offering the outfits in sizes XS to 4X. The collaboration, Barbie x Unique Vintage, celebrates 1950s and 1960s Babs. The company that sells online and in about 500 boutiques around the world plans to go even bigger for Barbie’s big 6-0 next year, offering key fashion moments from across the rest of her decades. Katie Echeverry is founder, CEO and creative director of Unique Vintage, an 18-year-old company based in the US state of California. With her long blonde locks and Barbie-esque dimensions, Echeverry said she was a Babs fan as a girl but was also a ‘tomboy’ who loved to play softball. During a recent round of media interviews explaining how the collaboration came about, she donned a Kelly-green shawl dress worn by Barbie in 1962 and done by Unique Vintage in a forgiving stretch fabric. Noteworthy was her most definitely un-Barbie upper-arm tattoo, on proud display in the off-shoulder outfit, as she recalled her luck. Katie worked closely with Mattel but ‘they didn’t dictate what I chose’. Mattel opened its archives to her as she went about duplicating outfits, with adjustments to account for the real human form. She said she chose looks that ‘spoke to me’. Barbie, the doll, first hit store shelves in 1959. That year, she stepped out in a swirl of gold and white brocade for evening. The dress was among those Katie picked and sells for BD44 on uniquevintage.com. The matching collar coat with three-quarter sleeves trimmed in faux fur goes for BD56. Katie’s first Barbie go-around dropped in the spring. Social media fans of vintage and of Barbie took notice and sales have been brisk, she said. For autumn, her prices range from BD33 for an A-shaped Barbie flare skirt in green with a white hem to BD75 for the doll’s red matinee sleeveless sheath dress and short jacket trimmed with calico-coloured faux fur. It was important to Echeverry to choose looks that have remained iconic through the years but were wearable by women in the broad range of sizes she is committed to providing. “I was like a kid in a candy store,” she said. After the first season went on sale, Katie watched the response online, where nostalgia kicked in among fans who recalled favourite outfits, some gushing how they’d always wondered what it would be like to wear the looks themselves. She was also dedicated to the price points she knows her buyers are after. “I know our customer and she doesn’t want to spend a lot of money, and I understand that,” Katie added.